From an idea of Massimo Mozzi, with the collaboration Confectioners Group of Verona, he was born Browse Recioto. Unique of its kind, it is a light pastry made with high quality butter of Monti Lessini and Recioto della Valpolicella make these puff pastries a real treat. 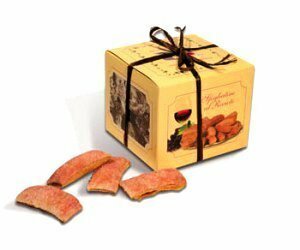 The dough is the Union of high confectionery veronese with the sublime wines of Valpolicella! It is recommended to be combined with the Recioto of Valpolicella Brothers Vogadori! Ingredients: flour, butter, Recioto of Valpolicella Vogadori Brothers, sugar, salt. For more information go to the official site!